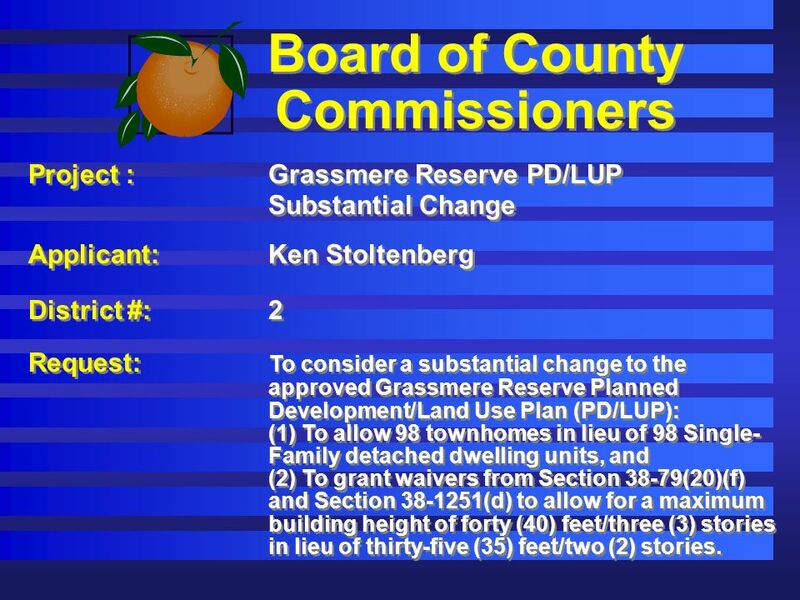 2 Board of County Commissioners Project :Grassmere Reserve PD/LUP Substantial Change Applicant: Ken Stoltenberg District #:2 Request: To consider a substantial change to the approved Grassmere Reserve Planned Development/Land Use Plan (PD/LUP): (1) To allow 98 townhomes in lieu of 98 Single- Family detached dwelling units, and (2) To grant waivers from Section 38-79(20)(f) and Section 38-1251(d) to allow for a maximum building height of forty (40) feet/three (3) stories in lieu of thirty-five (35) feet/two (2) stories. Project :Grassmere Reserve PD/LUP Substantial Change Applicant: Ken Stoltenberg District #:2 Request: To consider a substantial change to the approved Grassmere Reserve Planned Development/Land Use Plan (PD/LUP): (1) To allow 98 townhomes in lieu of 98 Single- Family detached dwelling units, and (2) To grant waivers from Section 38-79(20)(f) and Section 38-1251(d) to allow for a maximum building height of forty (40) feet/three (3) stories in lieu of thirty-five (35) feet/two (2) stories. 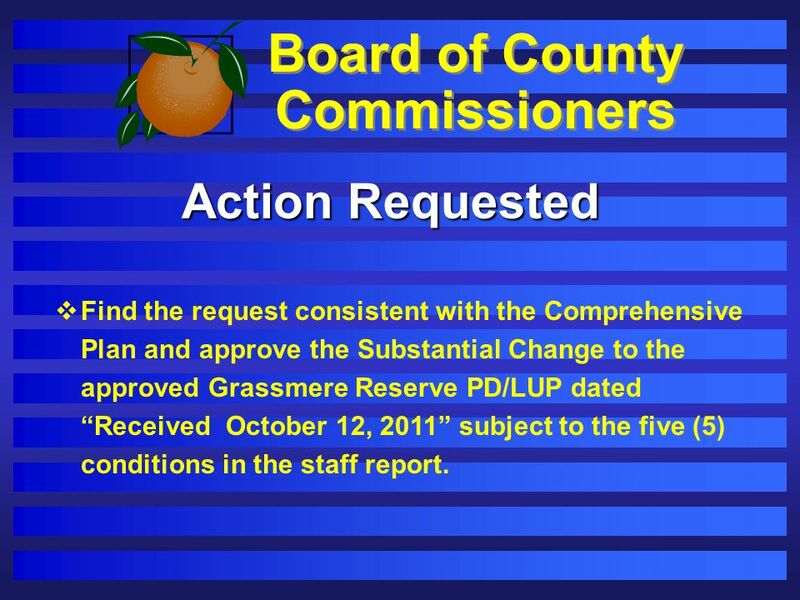 6 Board of County Commissioners Action Requested Find the request consistent with the Comprehensive Plan and approve the Substantial Change to the approved Grassmere Reserve PD/LUP dated Received October 12, 2011 subject to the five (5) conditions in the staff report. 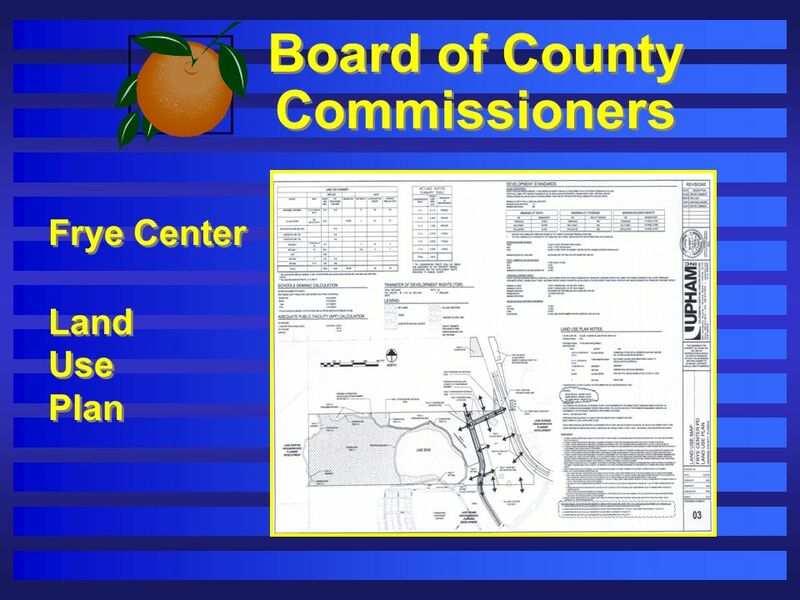 8 Board of County Commissioners Request: To consider a substantial change to the approved Frye Center Planned Development/Land Use Plan (PD/LUP) to grant four waivers from the original version of the Horizon West Village Code, applicable to Tract 1, Lot 2 only: 1)A waiver from Section 38-1387(b)(9) to allow for a minimum of two (2) attached units in lieu of five (5), 2)A waiver from Section 38-1387(b)(7)(a) to allow a front building setback of twelve (12) feet in lieu of fifteen (15) feet and a front porch setback of seven (7) feet in lieu of ten (10) feet, 3)A waiver from Section 38-1387(b)(7)(c) to allow a rear alley setback of ten (10) feet from the easement centerline in lieu of fifteen (15) feet from the easement centerline, and 4) A waiver from Section 38-1387(b)(7)(b) to allow an end unit setback of two point five (2.5) feet in lieu of seven (7) feet. This request will provide a building separation of five (5) feet in lieu of fourteen (14) feet. 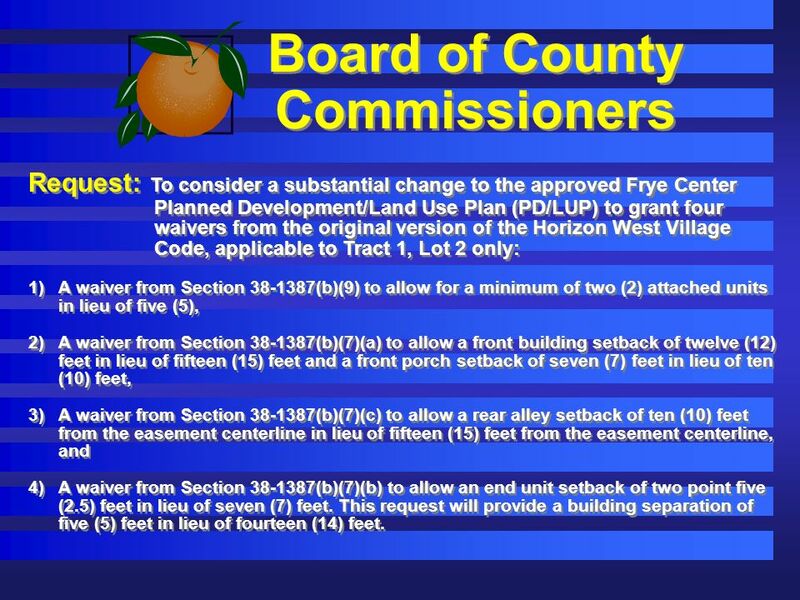 Request: To consider a substantial change to the approved Frye Center Planned Development/Land Use Plan (PD/LUP) to grant four waivers from the original version of the Horizon West Village Code, applicable to Tract 1, Lot 2 only: 1)A waiver from Section 38-1387(b)(9) to allow for a minimum of two (2) attached units in lieu of five (5), 2)A waiver from Section 38-1387(b)(7)(a) to allow a front building setback of twelve (12) feet in lieu of fifteen (15) feet and a front porch setback of seven (7) feet in lieu of ten (10) feet, 3)A waiver from Section 38-1387(b)(7)(c) to allow a rear alley setback of ten (10) feet from the easement centerline in lieu of fifteen (15) feet from the easement centerline, and 4) A waiver from Section 38-1387(b)(7)(b) to allow an end unit setback of two point five (2.5) feet in lieu of seven (7) feet. This request will provide a building separation of five (5) feet in lieu of fourteen (14) feet. 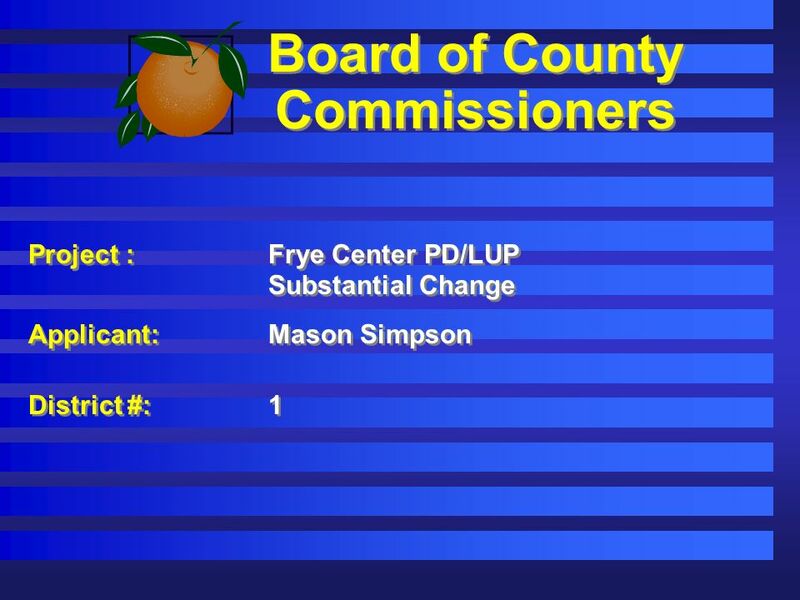 12 Board of County Commissioners Action Requested Find the request consistent with the Comprehensive Plan and approve the Substantial Change to the approved Frye Center PD/LUP dated Received October 25, 2011 subject to the four (4) conditions in the staff report. 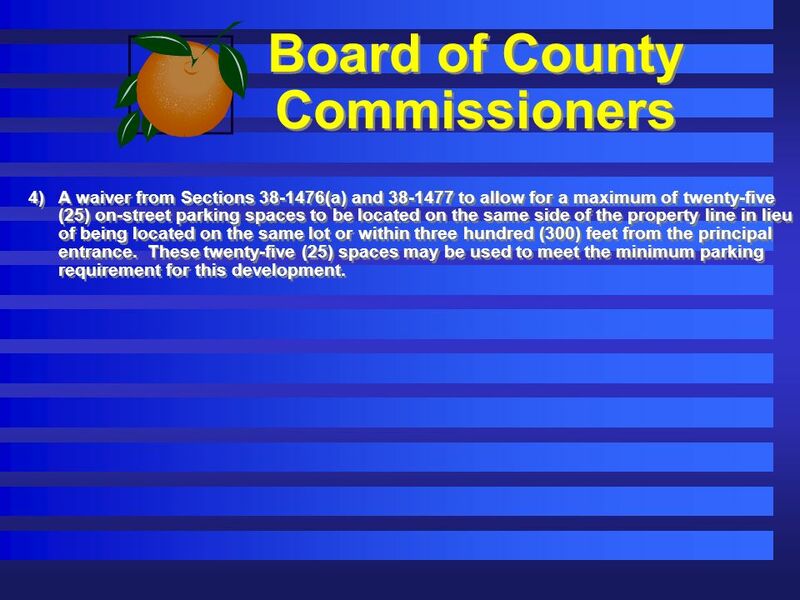 17 Board of County Commissioners d.A waiver from Section 38-1387(b)(5) to allow an increase in the maximum building height to three (3) stories and forty five (45) feet in lieu of forty (40) feet, and e.A waiver from Sections 38-1387(b)(11) and 38-1384(e) to modify the porch requirements as follows: Front porches (i.e., covered entrances at the breezeways) will only be required for each building fronting a public right-of-way (southern connector road and Lake Village Road). 2)The following waivers for Multi-Family residential: a.A waiver from Sections 38-1258(a), 38-1258(b), and 38-1258(c) to allow three (3) story multi-family buildings to be located within eighty (80) feet of single-family zoned property, and b.A waiver from Section 38-1258(j) to allow for a minimum building separation of twenty (20) feet for two-story and three-story buildings, in lieu of thirty (30) feet and forty (40) feet, respectively. 3)A waiver from Section 38-1254 to allow for a minimum front setback from twenty-five (25) and thirty-five (35) feet to fifteen (15) feet. 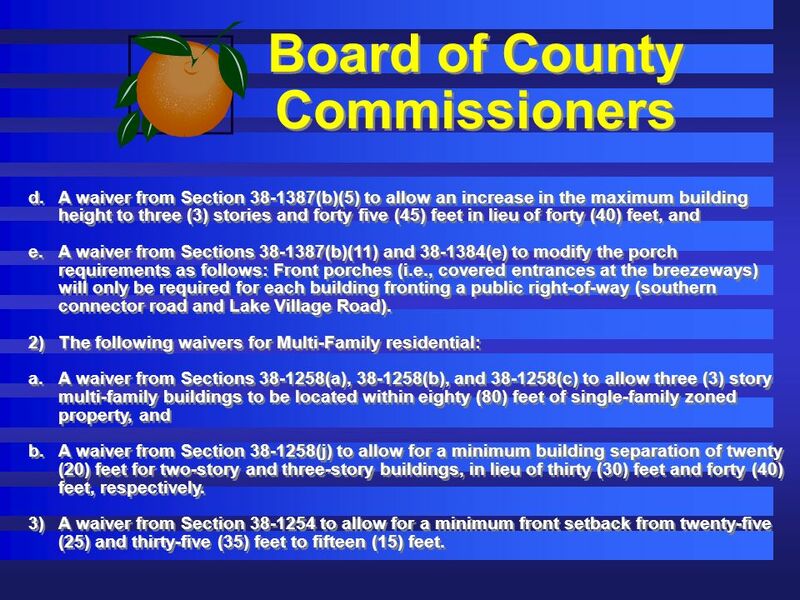 d.A waiver from Section 38-1387(b)(5) to allow an increase in the maximum building height to three (3) stories and forty five (45) feet in lieu of forty (40) feet, and e.A waiver from Sections 38-1387(b)(11) and 38-1384(e) to modify the porch requirements as follows: Front porches (i.e., covered entrances at the breezeways) will only be required for each building fronting a public right-of-way (southern connector road and Lake Village Road). 2)The following waivers for Multi-Family residential: a.A waiver from Sections 38-1258(a), 38-1258(b), and 38-1258(c) to allow three (3) story multi-family buildings to be located within eighty (80) feet of single-family zoned property, and b.A waiver from Section 38-1258(j) to allow for a minimum building separation of twenty (20) feet for two-story and three-story buildings, in lieu of thirty (30) feet and forty (40) feet, respectively. 3)A waiver from Section 38-1254 to allow for a minimum front setback from twenty-five (25) and thirty-five (35) feet to fifteen (15) feet. 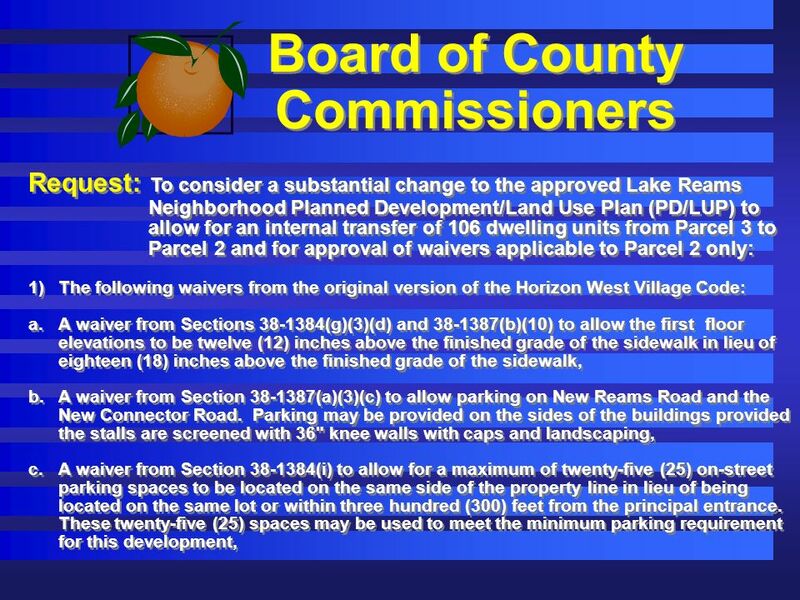 18 Board of County Commissioners 4)A waiver from Sections 38-1476(a) and 38-1477 to allow for a maximum of twenty-five (25) on-street parking spaces to be located on the same side of the property line in lieu of being located on the same lot or within three hundred (300) feet from the principal entrance. These twenty-five (25) spaces may be used to meet the minimum parking requirement for this development. 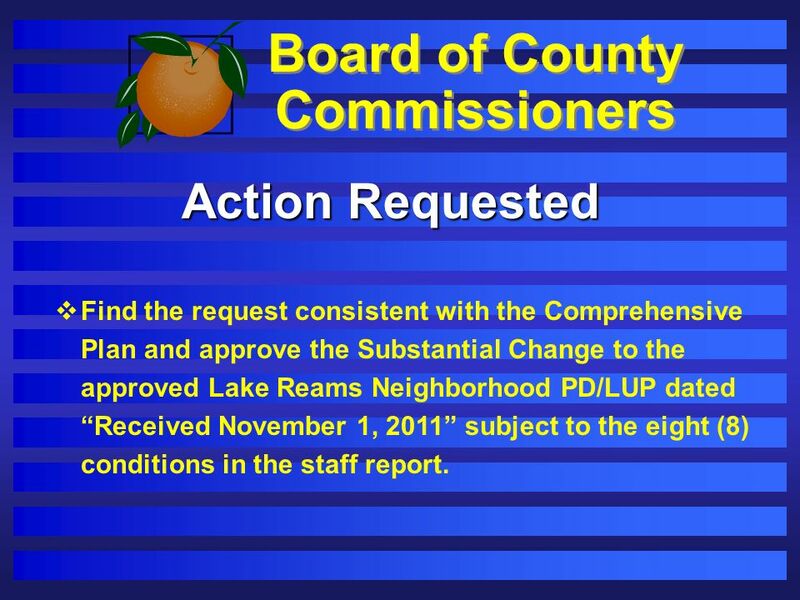 22 Board of County Commissioners Action Requested Find the request consistent with the Comprehensive Plan and approve the Substantial Change to the approved Lake Reams Neighborhood PD/LUP dated Received November 1, 2011 subject to the eight (8) conditions in the staff report. 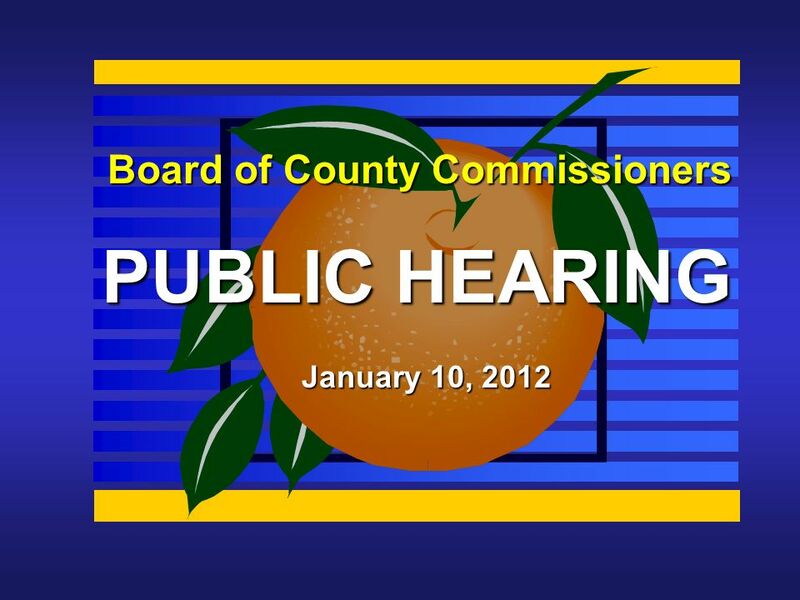 Download ppt "Board of County Commissioners PUBLIC HEARING January 10, 2012." APRIL 19, 2011 BCC PUBLIC HEARING ON BZA #VA , December 2, 2010 APPLICANT: AMOS and IRIT VIZER APPELLANT: KENDELL KEITH. 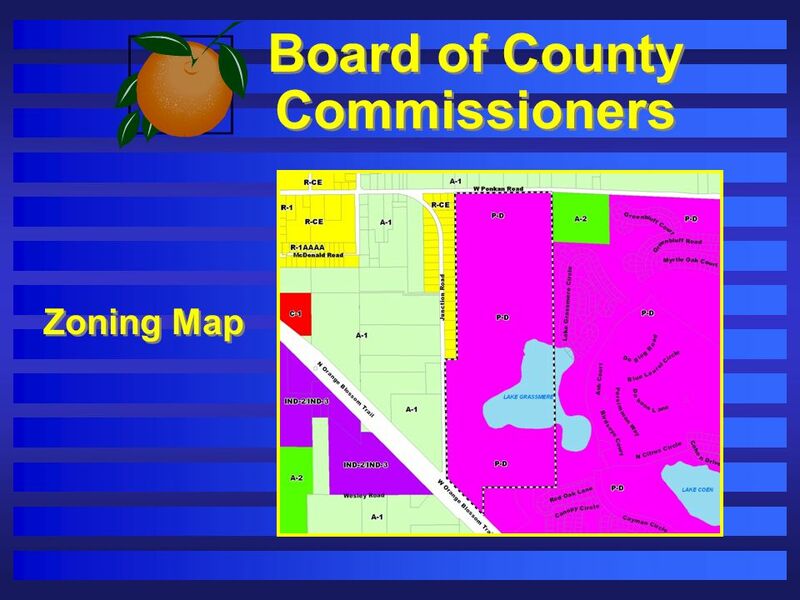 Board of County Commissioners PUBLIC HEARING August 11, 2009. 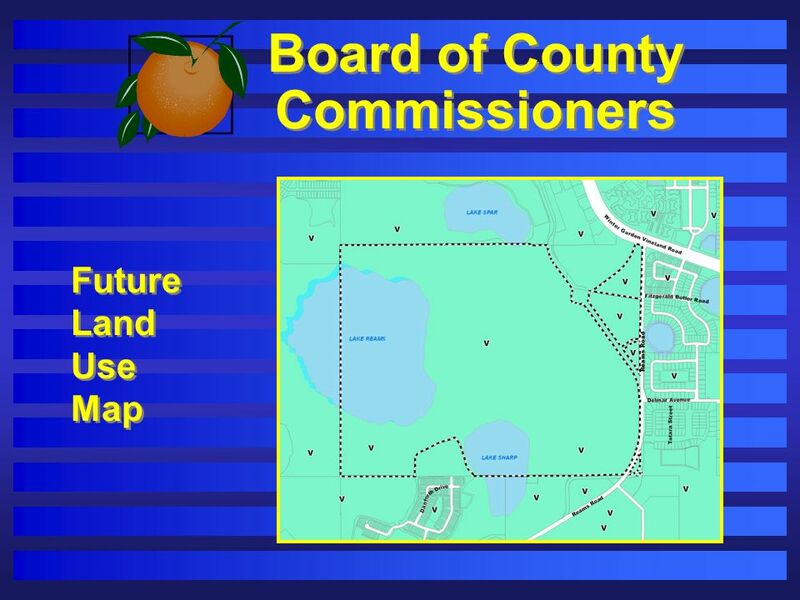 Public Hearing October 30, Case:PSP Project:Northeast Resort Parcel (aka NERP PD) Planned Development/Phase 2 Preliminary Subdivision. 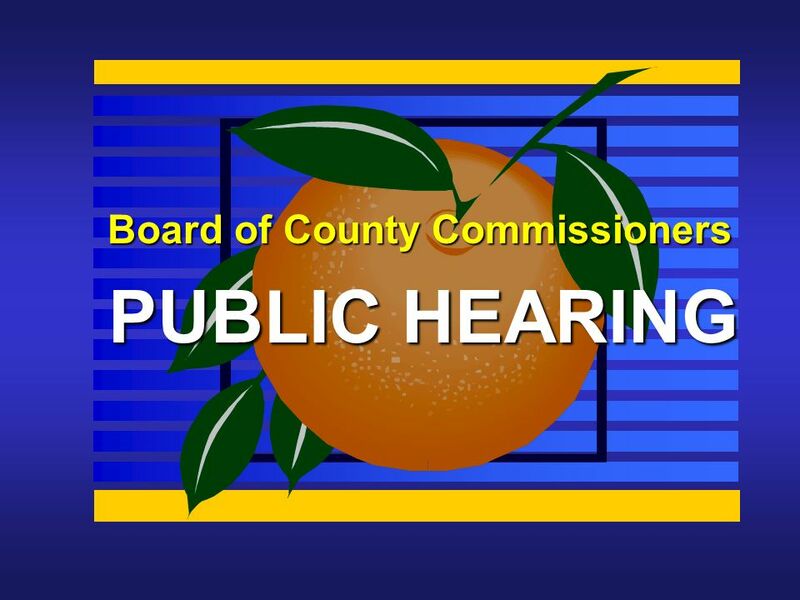 Public Hearings August 27, Case: CDR Project: Village F Master PD / LUP Applicant: Lance Bennett, Poulos & Bennett, LLC District: 1 Proposed:Reconfiguration. 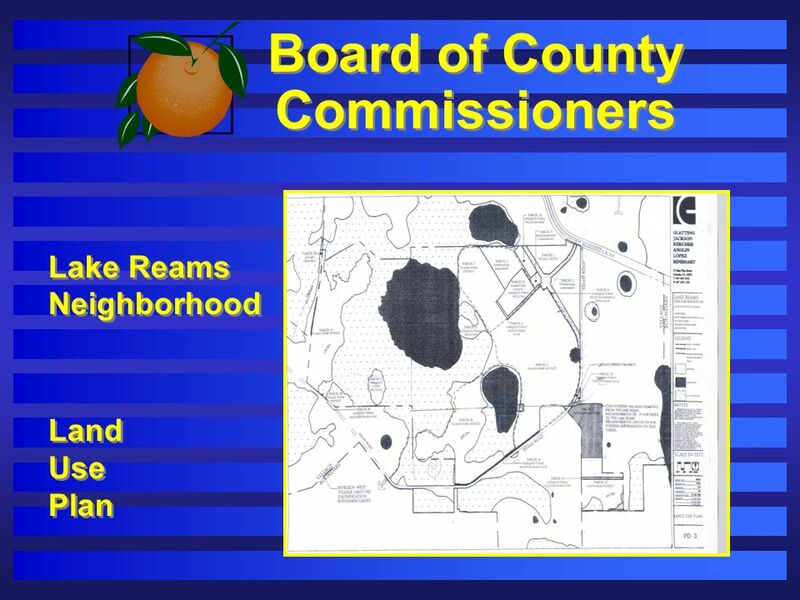 Board of County Commissioners PUBLIC HEARING October 23, 2007. 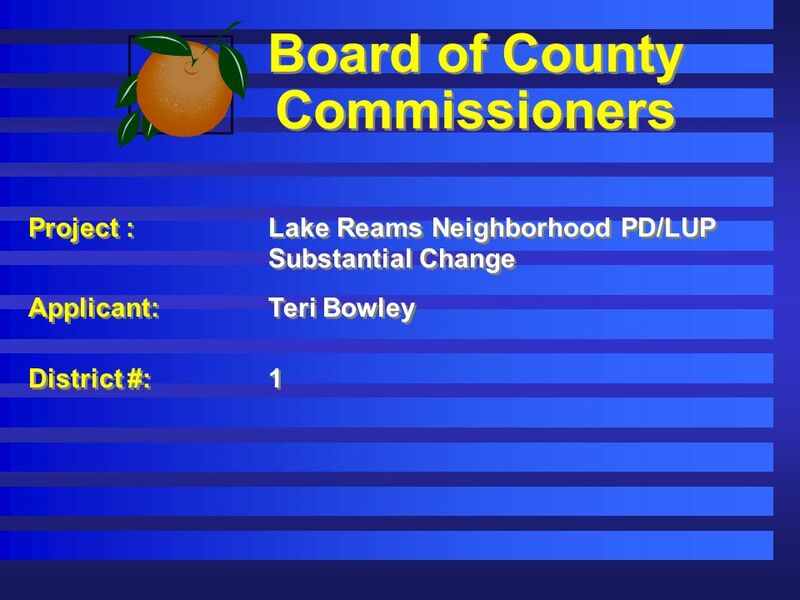 Public Hearing June 4, Case: CDR Project: Winegard Road South PD LUP - Substantial Change Applicant: Hugh M. Lokey, P.E., Hugh M. Lokey. Public Hearing June 26, Case:CDR Project:Stillwater Crossings and Center Bridge Planned Development / Land Use Plan (PD/LUP) - Substantial. 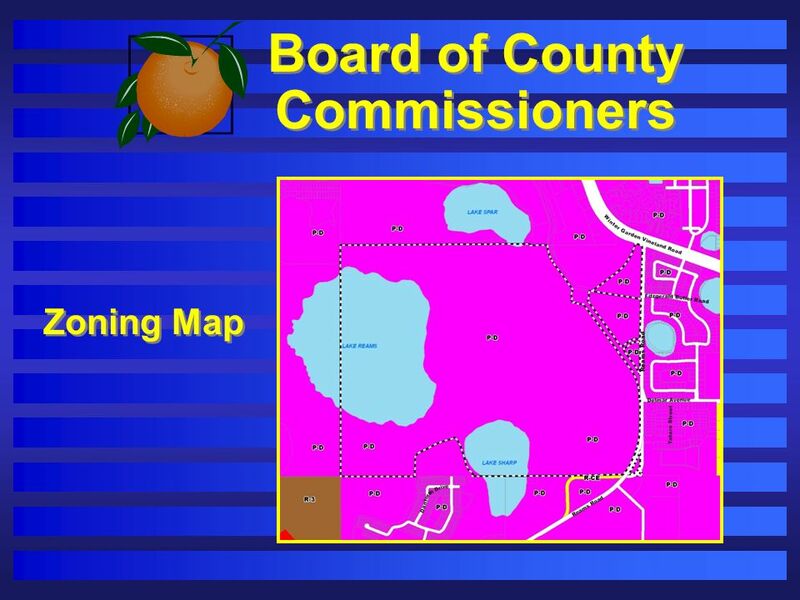 Board of County Commissioners PUBLIC HEARING January 15, 2008. Public Hearing April 30, Case:LUPA Project:Universal Boulevard PD LUPA (a.k.a. “U.S.I. South Campus PD”) Applicant:Jay R. Jackson District:6. 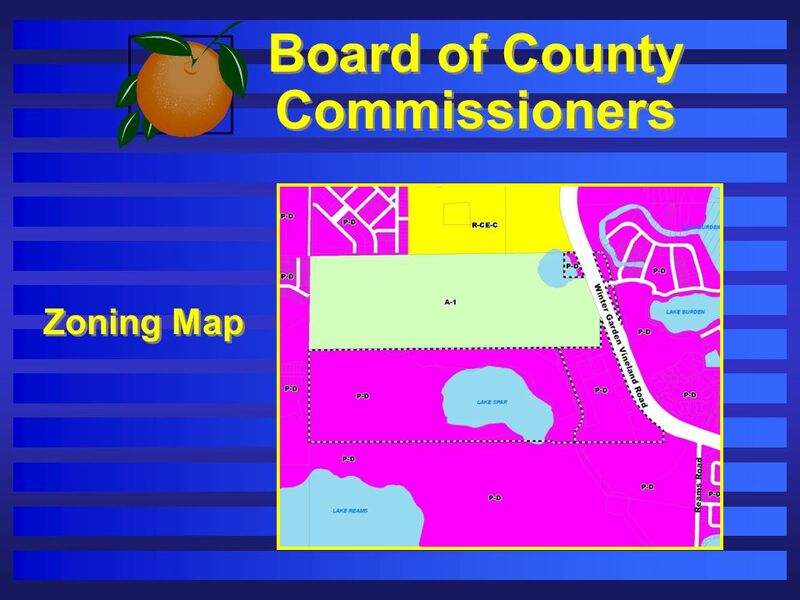 Board of County Commissioners PUBLIC HEARING August 21, 2007. 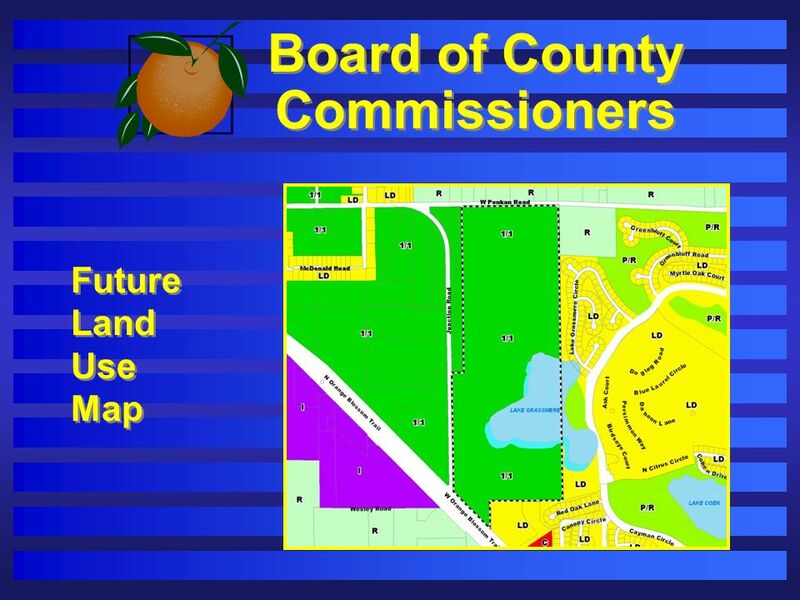 Public Hearing January 8, Case:CDR Project:Waterford Commons Planned Development/Land Use Plan (PD/LUP) - Substantial Change Applicant:Bob. Case: CDR Project: Central Church of the Nazarene Planned Development (PD) / Land Use Plan (LUP) Applicant: Jeff W. Banker, Highland Engineering. Board of County Commissioners PUBLIC HEARING Lake Avalon Rural Settlement Commercial Design Overlay District March 10, 2009 Board of County Commissioners.